Las Campanas Compadres continues to grow and service the needs of our community. Challenges remain, but we are confident that these will be met with the “can do” spirit that has been a signature of our program since inception. 2013 was an exciting year for us in many ways, and 2014 looks to be the same. We are proud of our achievements. Since inception in May 2007, LCC has underwritten over 6,000 ½-hour private tutorial riding and swimming lessons. Our student numbers continue to grow. We now have 77 registered students (up from 50 last year) on our roster and we continue to receive new applications on a regular basis. We currently underwrite 1,500 lessons per year. Karen Evans, our riding instructor, has settled in nicely and is now a veteran. Karen handled the challenge of being our new riding instructor, assimilated into the program with ease, and has earned the trust and respect of all of her students. Luis Gonzales continues to be an invaluable member of our riding program. Our students love him and we all have a hard time imagining the program without Luis. David Caldwell, our swimming instructor, continues to expand his program and is always coming up with ways that we can improve on our offerings. Sunny, our Norwegian Fjord pony that we purchased late in 2012, has proven to be a great addition to our program. He has a wonderful disposition and has taken on the challenges of being a special needs horse extremely well. We also want to thank John and Maureen Graf for donating their horse, Bolero, to our program. Bolero is just beginning his new career as a special needs horse, and thus far has done a stellar job for us. We are lucky, and grateful, to have Bolero in our program. We had a number of changes at the board level. Pam Franco served us with great dedication and energy. Pam has entered a new chapter in her life and no longer was able to commit the time. George Collins has also moved on. In fact, George has relocated to Florida and therefore was unable to participate at the board level. George and Pam will be sorely missed and we want to publicly thank them for their service. We have, however, gained three new board members. Britt Gladu is Director of Membership Development for The Club at Las Campanas. Britt brings great energy to the board and serves on a number of committees. Karen Evans and David Caldwell have also joined our board. Both bring invaluable insights into our students and their needs, and they have already had an impact in making our organization a better one. We want to thank our new board members for stepping up to the plate. We are immensely appreciative of all our board members who selflessly give their time and energy to our program. However, we feel compelled to make special mention of Bob Lehrer and Darlene Romero. Bob is our CFO and has served on our board since inception. He puts in an enormous amount of work and gets involved in everything. If something needs doing, Bob is our go to guy. It is hard to imagine our program without Bob. Darlene, simply put, is an amazing human being. We have known Darlene and her family since we volunteered in the Adaptive Ski Program nearly 10 years ago. 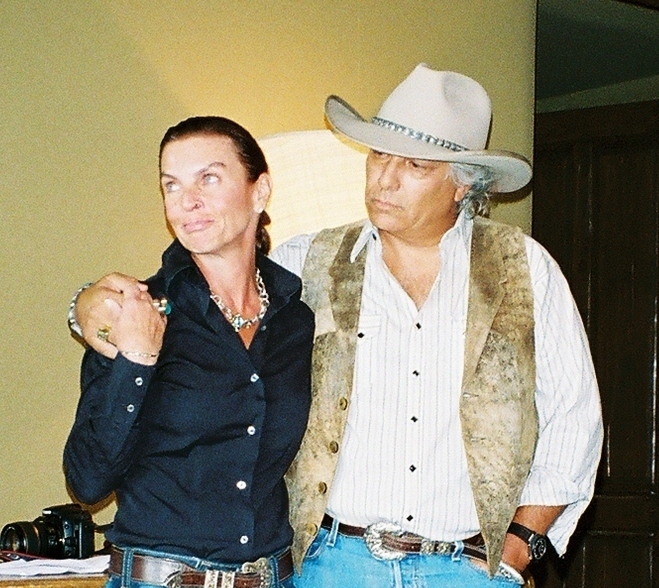 Darlene’s son, John “Mad Dog” Romero, has been with us since the very beginning. Darlene has had a huge impact on our program. In addition to serving as our secretary, she and John run all of our social networking initiatives, serves on a number of committees, and is one of our best ambassadors. We don’t know where she finds the time and energy, but if they ever bottle it, we’re buyers! Last year’s Annual Awards event took place in the fall and was a great success. This year’s event will again be on Columbus Day, October 13th. The children are off from school and it means that a lot more parents and relatives can attend the ceremony. Last year we awarded each student with a handsome trophy inscribed with their name. A total of 37 awards were handed out with over 80% of our students receiving achievement awards for both riding and swimming disciplines. We also want to thank all the parents who brought food and refreshments. We were once again proud to announce the winners of The Ron Walters Award for 2012. It is always difficult to single out any one particular volunteer as all of our volunteers are incredibly helpful in so many ways. Suzanna and I always struggle with our decision. That being said, we are delighted to announce that last year there were several recipients, and the choices were easy ones to make. Mimi Kingsbury is relatively new to our program but that has not stopped her from rapidly becoming one of our most valued and respected volunteers. Her commitment to the swimming program has been invaluable, and she has a kind and gentle way with our students who love her. Linda Factor has a cheery disposition. The students love her as she always brings compassion and a positive disposition to every lesson she undertakes. Linda takes on a heavy load of lessons, and we are very fortunate to have her in our program. Our 5th Annual Mini Tri was a great success thanks to the hard work and dedication of our board, volunteers, The Club at Las Campanas staff, corporate sponsors, and individual donors. I am pleased to report that we raised $65,294. We had 130 mini tri participants, the same as the previous year. The atmosphere can only be described as high energy, and we think a good time was had by all. We once again used a professional organizer, FIT FUNdamentals, to organize the event and they did a great job. We had a new announcer, Rey Post, who kept the energy level high all morning by conducting interviews with participants and volunteers alike. Rey has a very successful radio program here in town called “All Things Real Estate”, and we get a six minute slot, once a month, to talk about our program. Rey did a great job for us last year and has signed on for this year’s event. There were 19 special needs teams last year, up from 11 the previous year. Suzanna and I want to especially thank David Loan, General Manager; Andrew Nichols, Executive Chef; Tony Blankenship, Sous Chef; Jason Epstein, Director of Golf Operations; Tom Egelhoff, Director of Agronomy; Britt Gladu, Director of Membership Development; Eliesa Webb, Assistant To Events and Catering Director; and Todd Shaw, Fitness and Tennis Director, for pairing up with one of our students and giving them the chance to participate in the race. This is a big deal for our students and can only be accomplished if you have people less concerned about winning and more concerned about giving. It is impossible to list the names of everyone who helped make this event the success that it was. That being said, it would be remiss of me to fail to mention some members of staff who put in a lot of hours to make our event possible. Special thanks, therefore, go to Britt Gladu for her support and energy around Las Campanas Compadres; Kay Lee, who has a can do attitude and always went the extra mile for us; Pete O’Brien and Deborah Fahie for making the pasta dinner event the success that it was; Todd Shaw, Mike Simpson, Jeff Cisneros and Ashley Quintana, who were tremendously helpful in organizing the logistics of the race; David Loan who got behind the project early on and has been a great supporter; and of course all of the dining and spa staff that always did their job with a smile and offered encouragement to all the participants. Suzanna and I also want to especially thank all of last year’s volunteers. An event of this size is not possible unless a lot of people work together with a singular purpose in mind. They did a tremendous job and were the reason the event went off without a hitch. Many of them started the day at 5:30 AM and their energy and enthusiasm never flagged. We can only hope that they all step up to the plate again next year. We are grateful to have so many corporate and individual sponsors. A special thanks, in no particular order, go to United Airlines and Glenn Tilton who donated two business class tickets to anywhere in Europe that we were able to auction off for $7,000; United Rentals and Jenne Brittel who donated 400 baseball caps with our logo to be given out to all participants; The Lodge at Chama and Frank Simms who donated a two evening’s stay at his beautiful lodge and two days of trophy trout fishing that we were able to auction off for $1800; Mr. & Mrs. Robert McCloud who underwrote the cost of the tee shirts; Pietro Pertusini of Osteria D’Assisi restaurant fame, who donated a one week stay at his villa on Lake Como that auctioned for $1,750, Pat and Patti Carter who donated their beautiful home in Idaho that we were able to auction off for $1,750; Early & Early; Sotheby’s/Nancy Lehrer; Thornburg Investment Management; Thomas Mackell; Jewel Mark; ACC; Constellation Home Electronics; Roy’s Pest Control; Don Chalmers Ford; The Club at Las Campanas, The Compound, Albertsons, Amazon, Meddleton Equine, Eye Associates of New Mexico, and Devon Gilchrist. We do not anticipate that student growth will slow down during 2014. If anything we believe it will increase. Our challenge will be to accommodate this growth as we have capacity constraints both physically and financially. We will continue to accept new students and have instituted a rotation system in order to accommodate our increasing numbers. Our board has recently approved a student support scholarship program. This will be funded with $5,000 annually and monies will be used to assist our students in their scholastic endeavors. Suzanna chairs the committee and the board is looking forward to receiving their recommendations for implementation. We also underwrote half the cost of a new aquatic chair at the fitness center. This amounted to $3,322. Many of our students use this means of entering the pool as do some members of The Club at Las Campanas. Contributing to the cost of this new device was the least we could do in appreciation for the generosity of our membership in allowing us the use of their world class facilities. This year we are especially excited about our triathlon event which as most of you know is our one and only fund raiser. Matt Desmond runs a school locally that teaches junior athletes how to compete in triathlons. According to Matt, there is a paucity of events locally, and they are forced to travel far and wide to find events specially catered to a younger audience. So this year, in addition to our normal triathlon event, which will now be called our Sprint Tri, we will also run, simultaneously, an event for juniors that will be called our Mini Tri. Matt has already promised us 45 students, but we expect that once we go public with this announcement we could have well over 100 junior participants, in addition to 130 or more participants in our sprint tri. So this year’s event promises to take us to a whole new level, and we are frankly “stoked”. The good news is that this means greater exposure for our program, more corporate sponsors, and hopefully greater revenues. The challenge is that we are going to need a lot of volunteers. So if you think you can help out please contact us. Devon Gilchrist has put in a lot of work to improve our website. We encourage people to visit www.lascampanascompadres.org There you can find updates on what’s going on, download volunteer and student application documents, visit a photo library, and even make a donation using PayPal. LCC’s blog page and a Facebook page run by John and Darlene Romero are going strong. You can go to: https://benefitlcc.wordpress.com/ to go to our blog page to check out what’s going on in our program and to add your own commentary. You can also check out our page on Facebook. We believe Facebook and other forms of social networking will be important channels through which we can increase awareness in our program. Whether it is to announce events like Awards Day or the Mini Tri, or to attract volunteers and students, spreading the word is important and Facebook is a very efficient way to do this. You can also follow and tweet us on Twitter at “L_C_Compadres”. Our Albertson and Amazon programs are working out well for us. We have some more Albertson cards, so if you need one please contact us. The Amazon program can be used by anyone in the USA. It is a simple process of accessing the website through our website. If you do this once you are then recognized as an LCC Amazon friend and no matter how you access the Amazon website you will be recognized and up to 6% of your purchase will go to our program. We have high hopes for this program. Last year we raised $1,240 from the Albertson’s program and $528 from the Amazon program. We would hope that those numbers can increase and are consequently looking for ways to increase our exposure. LCC entered 2013 with $92,388 in the bank. We ended the year with $111,043. We have been overwhelmed by people’s generosity and our sincere gratitude goes without saying. During 2013 our total operating expenses were $78,612. Expenses are divided into two main categories. The largest expense category is the cost of our instructors and equipment. Last year this accounted for $57,300 of our operating budget. The balance of $21,312 was for office infrastructure. Our budget for 2014 is $83,800. We have budgeted $58,000 for programs and $25,800 for office infrastructure. Suzanna and I want to thank you once again for your support and generosity and we look forward to seeing you all during 2014. Rey Post’s “Super Bowl Sunday” broadcast was an opportunity for a family of Las Campanas Compadres to share their perspective and talk about the positive benefits of LCC programs in their lives. Darlene and John Romero describe how LCC is an example of the private sector of our community stepping up to help enrich the lives of people with disabilities. They also touched on the need for sponsors and volunteers for the Labor Day (Sept. 1, 2014) Mini-Triathlon fundraiser. Many thanks to Rey Post for featuring Las Campanas Compadres on his Sunday show, “All Things Real Estate”, in his Unique Destinations series.